While there is no formula for renovating and designing small spaces, contractors, interior designers and homeowners alike agree that modern designs work best in small areas. Reliant on clean lines, paired down elements and simplicity, modern designs can make typically small apartment rooms feel much larger. By choosing elements carefully, integrating built-in, carefully hidden storage solutions and working with light and textures, style never needs to be sacrificed to gain more space. maximize space but not sacrifice comfort and luxury. While the bathroom is probably the smallest space in any home – aside from closets – a lot of activity goes on there and room for supplies is usually high on a homeowner’s wish list. That said, most people want to make the most out of every square inch of space. With careful planning and ingenious solutions, a small bathroom can be designed to maximize space but not sacrifice comfort and luxury. Modern bathroom designs can create a sophisticated ambience with upscale amenities that includes granite countertops, modular storage, stylish lavatories, vanities and speciality features. Simple neutral color scheme paired with warm materials, minimal detailing and textures can make a major impact in any bathroom. Today, there is an abundant selection of “green” sustainable bathroom products to choose from. 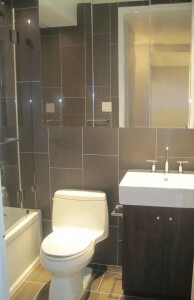 Following are some remodeling aspects that we recommend to maximize bathroom space. The choices available for bathroom lighting fixtures seems endless, but recessed lighting can create a soft glow and seemingly help the space to appear bigger. Wall-mounted, flat mirrors can reflect room lighting – a detail particularly useful in bathrooms without a window. The sleek modern designs of many modern fixtures can open up the space and compliment the overall atmosphere. Bronze and polished chrome finishes are the most desired today. Typical sink cabinets, while seemingly functional for storage can in reality, chip away at bathroom space. 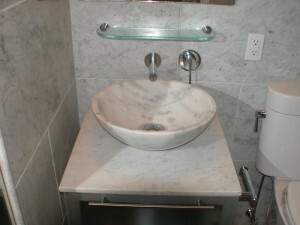 Pedistal sinks, counter-top vessel sinks and artisan sinks can, in fact, make the bathroom appear bigger. When space is at a premium, and it usually is in New York City apartments, reply on using vertical space. Shelving positioned above doorways and cabinetry that extends from floor to ceiling can claim a surprising amount of storage space. While showers curtains can make a bathroom appear to be smaller by separating the space, glass enclosures can create the opposite effects and seemingly double to room size. If privacy is an issue, patterns and etchings can still be used and not defeat the purpose. Monochromatic, soft, neutral color schemes can create the illusion of more space. Repeating wall color on the ceiling can give the illusion of height. Large floor tiles and subtle patterns will create less of a visual break that busy patterns and small tiles. Herringbone patterns in wood or bamboo flooring can bring just the right amount of warmth for those who feel modern designs can be cold. 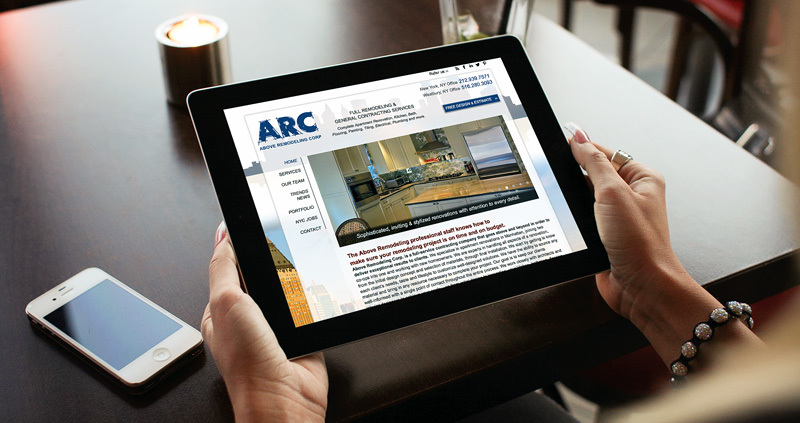 Contact Above Remodeling to discuss plans for your bathroom renovation.